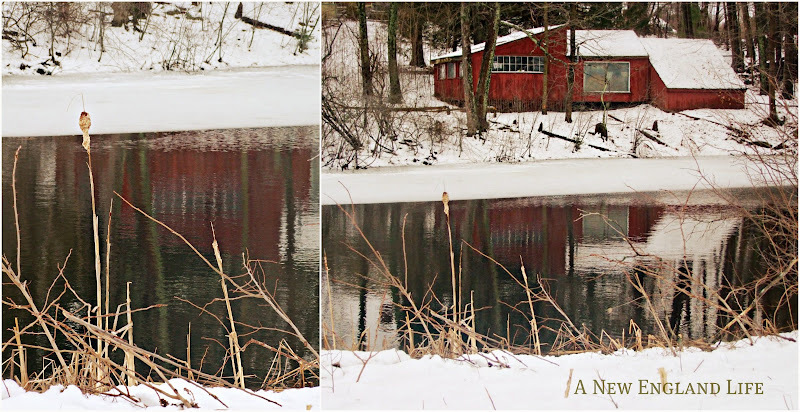 A New England Life: No joke! 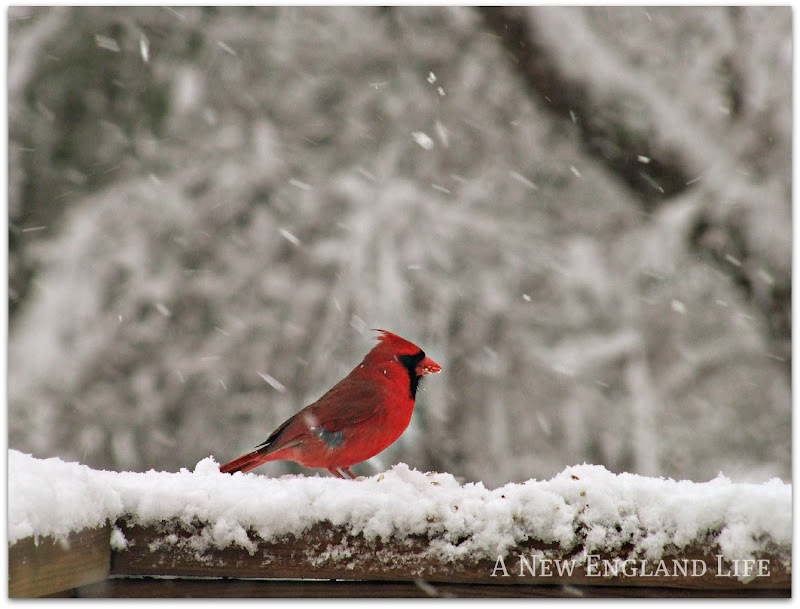 If you follow any other New England blogs then you know we had a snow storm yesterday. A pretty good one too! About 6" of wet, sticky snow. It's funny how the Bluebirds only show up when they are really hungry, and I knew yesterday morning they would be here like clockwork. Sure enough . . .
At this point it had started to rain and sleet. Then back to snow, and finally rain in the end. They appear a bit flummoxed about the situation, like they were hoping for meal worms at the very least! There were so many birds coming in to eat, including a Song Sparrow. What a delight to listen to him sing! He was here first thing this morning, but the Bluebirds have disappeared once again. 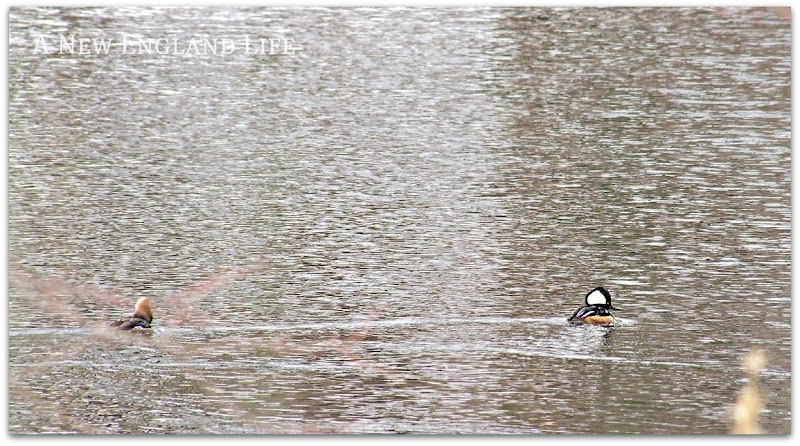 And swimming in that pond, as fast as they could to get away from me, a pair of Hooded Mergansers. Something you don't see every day! Always love your photos, especially the blue birds. They don't come to my yard since it's so closed in by trees, so it is always a delight to see them. I looked at intellicast and noticed your area of the country was supposed to get hit with snow AGAIN. Just cold and a bit wet here lately although today looks as if it could be sunny and a bit milder. 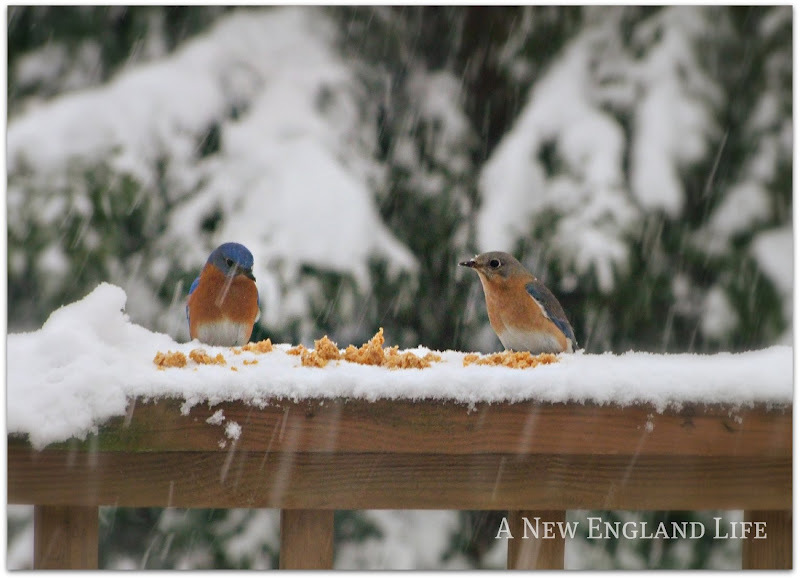 Those bluebirds look as though they feel betrayed by Mother Nature... never fear, birdies.... the snow will eventually go away. Yah, we've paid our dues this year. Enough is enough. It's odd that we don't get hoodies in Gloucester. Sad, but true. What a beautiful day! The shed looks smashing in it's white coat. Oh how I love feeding the birds. You had such a variety visiting! Just lovely. The blue birds are so pretty . I sure hope we dont get any more snow here. Love your photos. Stunning view. The shots of the birds are great. It is too funny, we both called our posts for 4/1/11, No Joke! Wow! I love the birds in this post. 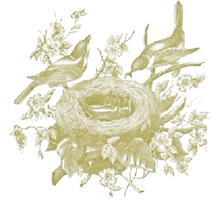 Living in NM I sometimes miss the birds of the east, although we have lovely birds here, I still think sometimes of the birds of my childhood. I saw on the news that area of the country got snow. Sorry. :( We have lots of blue jays, but rarely see a blue bird. Those are some great shots of the birds. Oh, that poor bluebird couple! And the rest of them too! I wish winter would just relent already! I saw that snow coming your way. It flurried here, and in the northern part of the county, it snowed a couple of inches, then quickly melted. Your bird photos had me smiling from ear to ear, Sharon. They're beautiful! Sharon, here's hoping that the last snow you get for the year! I always feel badly for the poor birdies when it is cold and rainy! I'm glad you put out a feast for them! I'm sure if those little birdies could talk they would say thank you Sharon for not forgetting us. I can't believe you got 6"!!!! Bad April fools joke! maybe this is the price we'll pay for better weather in May.....lets hope. your birds in the snow are beautiful! Beautiful captures of the birds. Here's hoping it will all be melted by...tomorrow! 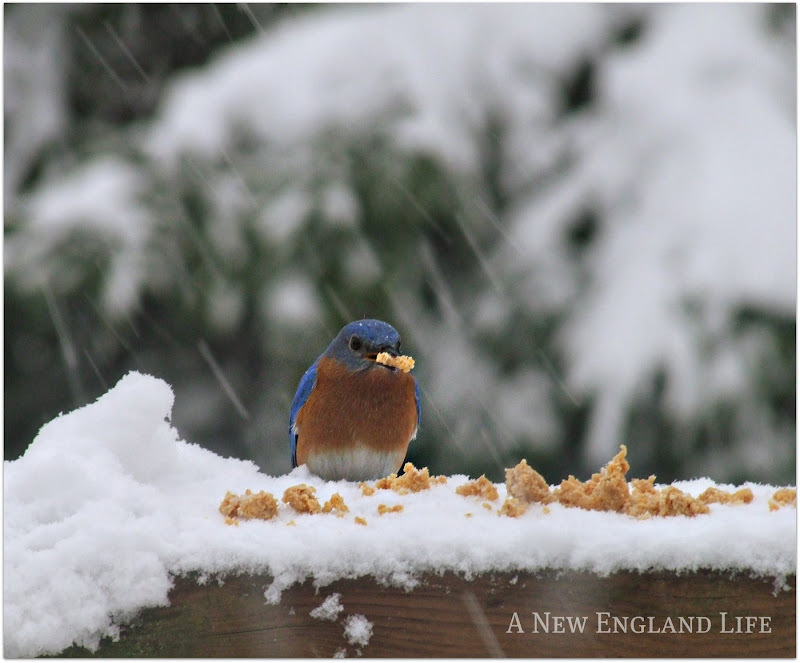 I love the photos of all the birds, with the snow as a back drop! It's hard to imagine snow when it was 97 degrees in AZ yesterday! Although I am not envious of your snow your photographs are absolutely beautiful! We got that snow too but a little less than you. It was annoying just the same. Your bird shots are lovely, perhaps they will be your Christmas card next year! Just beautiful! I'm curious, what did you feed the bluebirds? Did I tell you we had 8-10 bluebirds a few weeks ago? They were feasting on my hanging planter of greens and holly. It was amazing and all I had was my cellphone camera . . . Mother nature just seems evil now with all the snow. Enough is enough, right. Sharon, as always your photos are just beautiful. Beautiful birds, Sharon...Ooooo,that cardinal one is wonderful and those hooded Mergansers are to die for! There seem to be more birds every day, and where are we going to put all of them! After the long quiet winter, I simply can't believe there is enough room for all of them!!! I hope by this time that all your snow is gone for good! 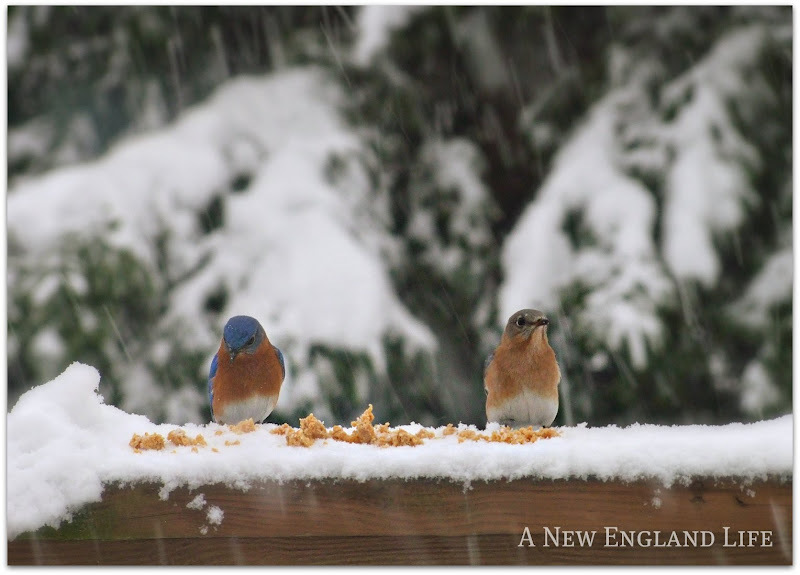 These shots are beautiful, especially the bluebirds. I occasionally see a few at the park, but never up close like this -- wonderful! I seem to not be able to keep up with all my blog friends anymore Sharon...but I have to say your photos are incredible...just beautiful. The birds the buildings your house....I could stare at them forever! I hope you are really getting the spring weather now! 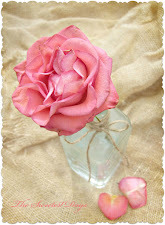 I love your beautiful pictures! Followed your link from Maya's Completely Costal and have been sighing over all the beautiful photos you are sharing here. Makes me very homesick for New England today.